Dr. Rumack: Captain, how soon can you land? Rumack: You can tell me, I'm a doctor. Oveur: No, I mean I'm just not sure. Rumack: Well, can't you take a guess?Oveur: Well, not for another two hours. The mother of all cinematic spoofs, Airplane! has left its uproarious imprint on every goofy satire of the past quarter century, yet no installment of The Naked Gun, Scary Movie, or Hot Shots has come close to equaling it. Packed with puns, clever wordplay, sight gags, innuendo, and infantile silliness, this laugh-out-loud classic never gets old, no matter how many times we board Trans-America Airlines' ill-fated Flight 209. Who among us can't quote at least a couple of the film's zany exchanges, hasn't mimicked Ted Striker's "drinking problem," or tried to "speak jive" like Barbara Billingsley? Few other comic movies possess as many memorable sequences or keep us in stitches for such lengthy periods than this unqualified�and totally unexpected�hit. I remember seeing an advance screening of Airplane! just prior to its initial release in 1980. Back then, I was a 17-year-old ticket-taker at a Connecticut movie theater, and the owner of the chain sponsored a special late-night screening for employees to drum up enthusiasm for the film. No one in the audience expected anything remotely special�in fact, we all thought Airplane! would be a cheaply made, forgettable bit of idiocy. We were right about the shoestring budget, but dead-wrong concerning the film's immediate and lasting appeal. We didn't just laugh, we howled, and as the jokes got sillier, we got giddier. As a fan of airline disaster movies, I loved how the writer-director trio of Jim Abrahams, David Zucker, and Jerry Zucker irreverently skewered the genre, but my affinity for classic film also allowed me to appreciate more obscure�but no less hysterical�references to pictures like Since You Went Away, Knute Rockne, All-American, and From Here to Eternity (even though on the commentary track the directors vehemently deny ever seeing the latter film before they wrote the screenplay). When it was over, nobody could stop talking about Airplane!�and we're still rehashing our favorite bits 25 years later. Such as...ditzy stewardess Elaine Dickinson (Julie Hagerty) manually inflating the blow-up autopilot (and sharing a cigarette with him afterwards! ); the extreme measures used to subdue a panicky female passenger; young Joey's eye-opening visit to the cockpit ("Have you ever seen a grown man naked? "); the resulting pandemonium when stewardess Randy (Lorna Patterson) orders the cabin to "assume crash positions"; and the outrageous antics of sprightly, dim-witted Johnny (Stephen Stucker), the airport flunky. There's also the pediatric heart patient (Jill Whelan) who learns how a bedside song can be hazardous to one's health, the housewife who's bewildered by her husband's in-flight behavior ("Jim never vomits at home. "), and the little girl who takes her coffee black�like her men. Airplane! borrows most of its cues (and several of its lines) from a 1957 B movie called Zero Hour!, in which rampant food poisoning sickens the cockpit crew and threatens to bring down a commercial plane. As luck would have it, one of the passengers is a former war pilot, but the psychological scars of a botched air raid make him more than a little reluctant to take the controls. Dana Andrews played Ted Stryker in the original film, and Robert Hays portrays the updated Ted Striker in Airplane!, battling the same neuroses while also trying to rekindle a shattered romance with the doe-eyed Elaine. In other roles, Leslie Nielsen (whose participation would unwittingly rejuvenate and reshape his already distinguished career by turning him into an all-too-willing buffoon) co-stars as the stone-faced doctor who keeps barking at people to surely stop calling him Shirley; Peter Graves plays the pilot who possesses a penchant for gladiator movies; Lloyd Bridges portrays the airport executive with myriad addictions ("I guess I picked the wrong day to stop sniffing glue! "); and Robert Stack lends support as Striker's tough and gruff former commanding officer, who winds up coaching him through the delicate landing procedure�but not before he pummels every bleeding-heart panhandler at LAX. It would be easy to overplay such lunacy, but what's so wonderful about all the performances is the earnestness lacing each and every line delivery. The actors, for the most part, don't mug; no matter how ridiculous the situation, they play it totally straight, and it's their sober outlook in an atmosphere of utter absurdity that injects bonus humor into the film. Of course, not all the gags work. Many provoke groans instead of guffaws, but the script's hit-and-miss nature lends the movie a certain off-the-wall charm. Even when Airplane! doesn't score outright, it wins points by constantly going for laughs, and the non-stop barrage keeps viewers upbeat and engaged. Hays and Hagerty will be forever identified with their roles, and put an endearingly dopey twist on dewy young love. Their story provides the sustaining narrative thread that holds Airplane! together and helps keep this high-flying farce airborne through hilariously choppy skies. If only every commercial flight�and comedic film�could be so much fun. 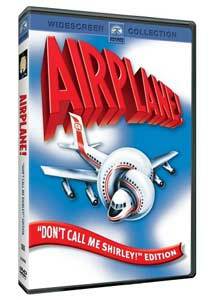 Image Transfer Review: Although labeled a special edition, the "Don't Call Me Shirley" incarnation of Airplane! employs the identical transfer used in the film's initial DVD release. That's not entirely a bad thing, considering Paramount has spruced up the film's image quality with enhanced clarity, rich and vibrant color, and good contrast. Blacks are deep and fleshtones look even and natural, while a slight amount of grain preserves the feel of low-budget celluloid. Surprisingly, though, the studio didn't take this opportunity to scrub away the considerable print debris that still remains. Sure, the specks and scratches only crop up sporadically, and rarely detract from the action on screen, but they're there nonetheless, and it would have been nice to have them removed. Audio Transfer Review: The 5.1 audio track (also recycled from the previous release) is crisp and full-bodied, with lots of dynamic range. Although surround activity remains minimal, the hum of the airplane engine subtly fills the room, and the sudden jolts and nosedives gain sonic heft from solid bass frequencies. Some distinct separation across the front channels slightly widens the sound field as it adds atmosphere to the loony goings-on. Thankfully, the endlessly quotable dialogue is always crystal clear, and Elmer Bernstein's terrific B-movie score sounds robust and appropriately melodramatic. Extras Review: There's a wealth of supplemental material on this special "Don't Call Me Shirley" edition, but accessing it all is a bit of a pain. Aside from the original theatrical trailer, all the extras are buried within the film itself, requiring either multiple viewings or careful scanning to absorb them. Unfortunately, there's also quite a bit of repetition, so bear that in mind when deciding which features to access first. The audio commentary�another holdover from the previous DVD�features producer Jon Davison and writers-directors Abrahams, Zucker, and Zucker. This is a quite lively, amusing, and involving track, filled with anecdotes, constant jokes about the movie's miniscule budget, and some playful barbs. The quartet discusses the history of the project (noting the script's first draft was written in 1974), and how they originally envisioned the story taking place on a propeller plane, just like Zero Hour!. (The studio demanded they transplant it to a jumbo jet.) They also address two popular misconceptions about Airplane!�that "there was lots of improvisation on the set, and we were stoned when we wrote it!" We learn Barry Manilow, of all people, was originally suggested for the role of Striker; that Pete Rose would have played Kareem Abdul-Jabbar's part if production hadn't conflicted with baseball season; and both George Kennedy and Helen Reddy were approached to reprise their Airport '75 roles, but Universal, the keeper of the franchise, wouldn't allow it. In addition, they recall how the picture was criticized for being too risqu� and raunchy when it first came out, and that Aero Mexico was the only airline to buy in-flight-movie rights to the film. New to this release (finally!) is the Long Haul Version, which inserts marvelous interviews and a few deleted scenes into the body of the film whenever a Trans-America Airlines icon appears in the lower righthand corner of the screen. Although watching Airplane! this way takes a good bit of time�thanks to the extensive material�it's well worth the effort, as practically every living cast member of note (with the glaring exception of Julie Hagerty) reminisces about their experiences making the film. Robert Hays, Peter Graves, Leslie Nielsen, David Leisure, Lorna Patterson, the two jive-talking African-Americans (who recall how they taught Barbara Billingsley to speak their language), and even little Joey (now all grown up) provide lots of delightful and engaging anecdotes. Abrahams, Zucker, and Zucker also contribute, and clips from Zero Hour! show just how closely Airplane! mirrors that cult classic. And if you're not sick of the film just yet, try the Trivia Track, which offers another innovative way to enjoy the movie. Borrowing the "pop-up" technology pioneered by VH1, this active track supplies a constant barrage of Airplane! minutia, such as identifying extras and citing bits of both pertinent and worthless information. Twenty-five years after it crash-landed on America's movie screens, Airplane! remains one of the funniest and most irreverent films of all time. This new special edition doesn't include enough fresh material to warrant an upgrade (unless you're a diehard fan), but if you haven't yet added this hysterical comedy classic to your collection, there's no better time.